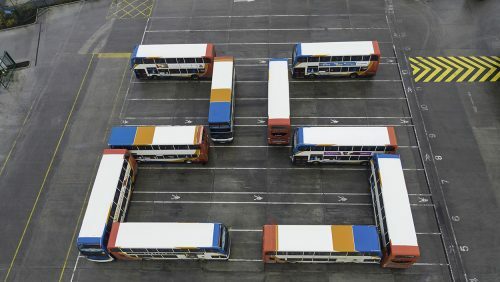 To mark 25 years in business, bus drivers at Stagecoach West arranged 10 buses to spell out the operator’s birthday in years, which was captured by a drone. Bill McCartney, Stagecoach West Depot Transport Manager – and one of those coordinating on the ground – said: “This was a bit of fun – and a challenge for the drivers and the drone pilot to get the buses in position and perfectly lined up in what were difficult weather conditions. Accompanying the display, two of the Stagecoach West double-deckers were given a special silver anniversary makeover, and are now operating in the Gloucester and Swindon areas. The operator also recently made a £250k investment in new engine technology for its Stagecoach Gold buses, which will reduce NOx emissions by 90%.